Just a really quick post today. I needed to make some lunch for Charles to take to work and I’d neglected my weekend grocery run this week so I decided tuna was the way to go. I think he has a toaster at work so he can toast his bread otherwise I’m sure it will be great on fresh bread too. I just went with a simple version. 1 can tuna; 5 o.z. Drain tuna and flake into bowl. Add remaining ingredients; I usually start with about half of the mayo and add more accordingly. Season with salt and pepper to taste. I served it with some lettuce, cheese, and wheat bread. We had a little more catfish to cook today and decided to make sandwiches. 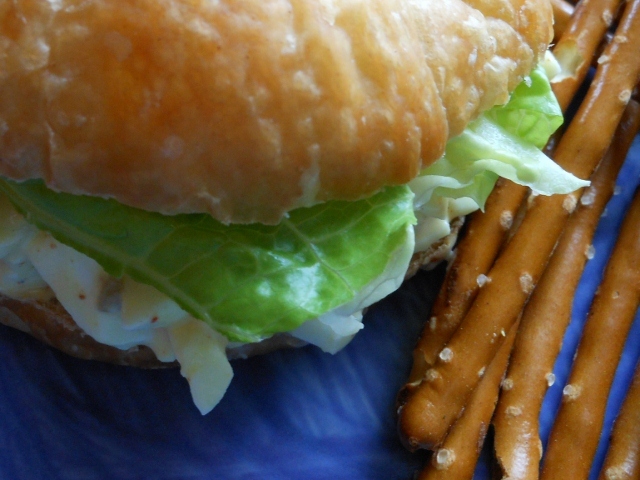 This sauce was a perfect alternative to traditional tartar sauce. Very spicy with the 2 tabasco peppers so adjust to your liking or leave them out if you prefer it mild. Combine all ingredients about 30 minutes or so before serving. 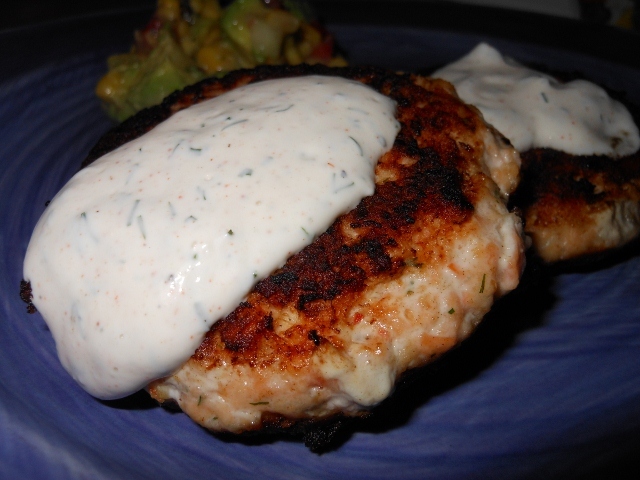 I made a tasty dill sauce to go with some salmon patties. A great compliment to the salmon (which I will post tomorrow); I am sure this would be delicious with any fish baked or fried. The dill works very well along side the dashes of cayenne and garlic. I think the balance of lemon juice, sour cream and mayonnaise is the key. Combine all ingredients ahead of time and refrigerate for 30 minutes or so before using. There is something magical about this ratio of mayonnaise, sugar, and vinegar that just works perfectly. It’s 2 parts mayo to 1 part sugar, 1 part vinegar. From there your imagination is the only limitation. Different flavors of vinegar, different additions of herbs and spices. 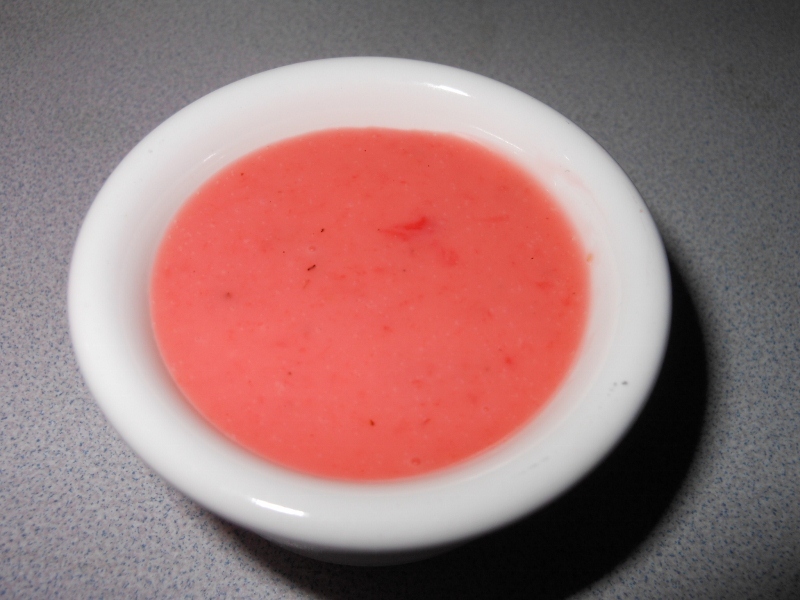 Even adding fruit such as in my strawberry dressing makes for an amazing flavor profile. This isn’t my prettiest slaw every. I tried a new attachment on the Cuisineart Charles found on an auction and it came out a bit fine and I was rushed for time so I didn’t add carrots but I figure you probably know what your favorite slaw type is so fix it your way! Mix mayo, vinegar, and sugar. Add celery seed and sprinkle with salt and pepper. 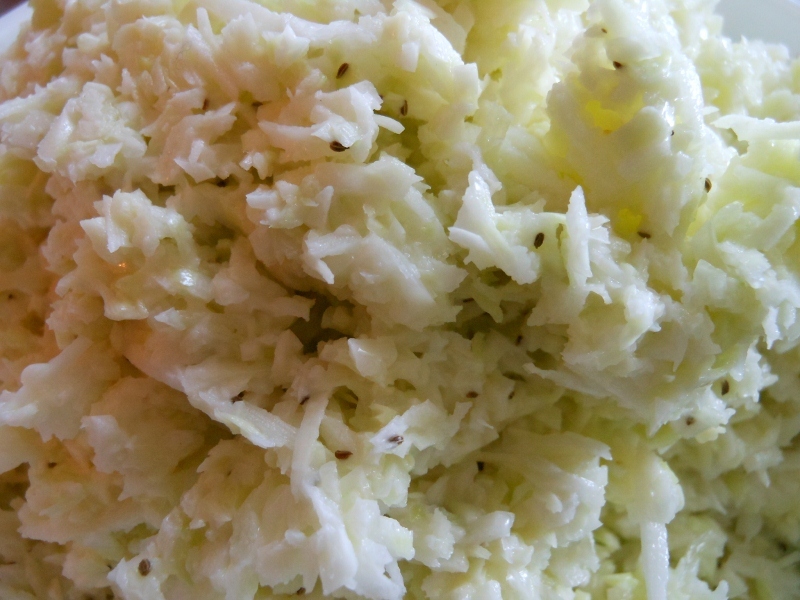 Toss with cabbage and refrigerate until ready to serve. I had a bit of baked ham left and couldn’t decide what to make. 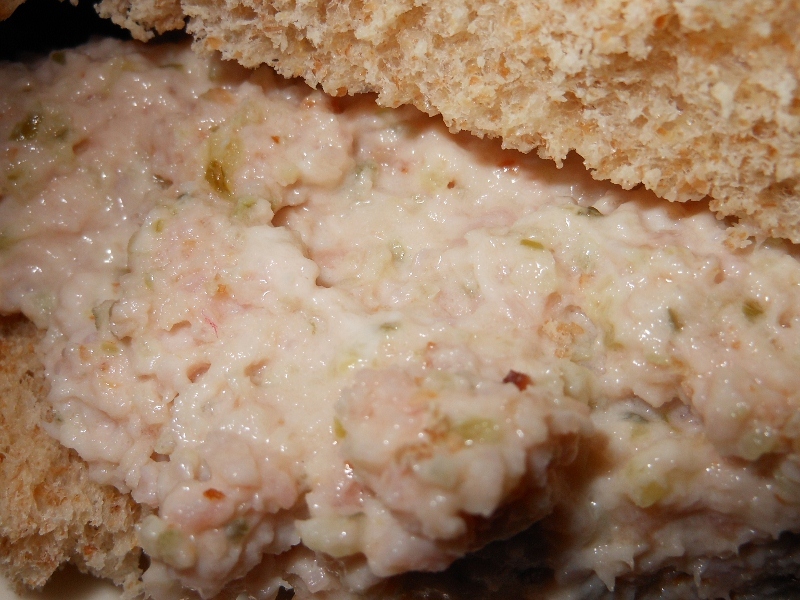 I was strongly contemplating ham and beans but with the warm up in the weather a ham salad sandwich sounded perfect. 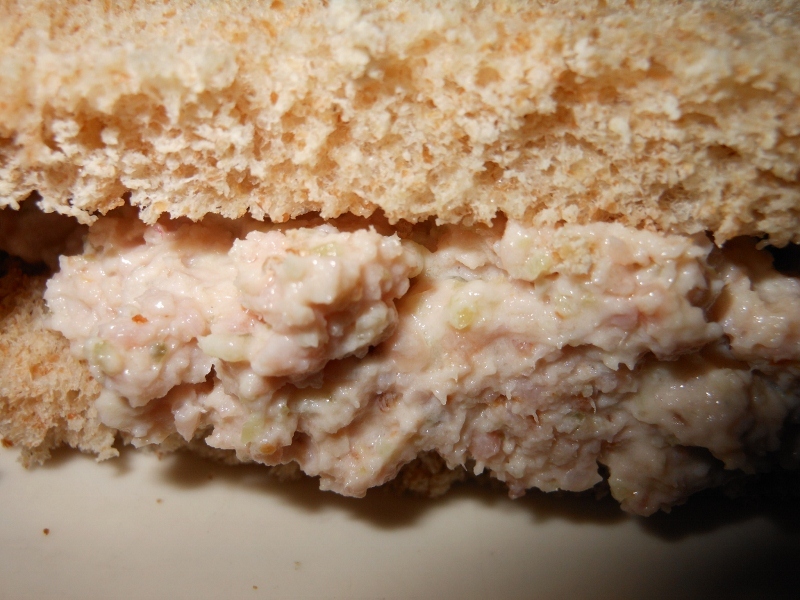 Mom used to make ham salad when we were kids. We’d get out the meat grinder and grind up pound after pound of ham and some of the pickles from the giant jar she always had on hand. I decided to use my food processor today. I do prefer the texture of the meat grinder, but still delicious either way. Grind up ham and pickles. 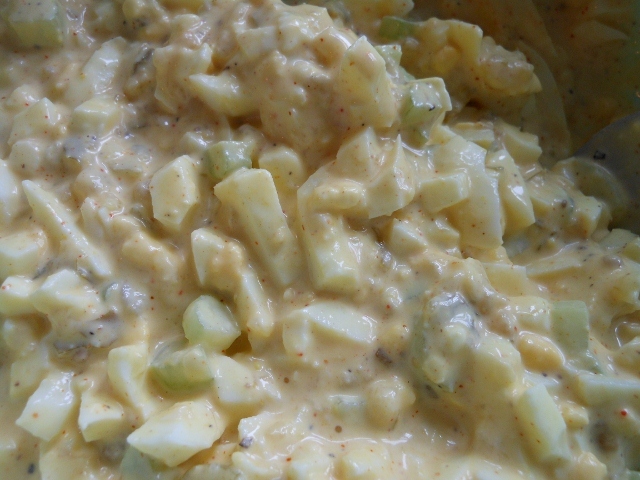 Mix in mayonnaise ~ add more or less to taste. Just a short post today but a very good salad dressing! This is one of my favorite dressings to make in the spring when the berries are getting ripe. However I still have some freezer preserves on hand so I couldn’t help but make some strawberry dressing. I’ll update this in the spring or post another. 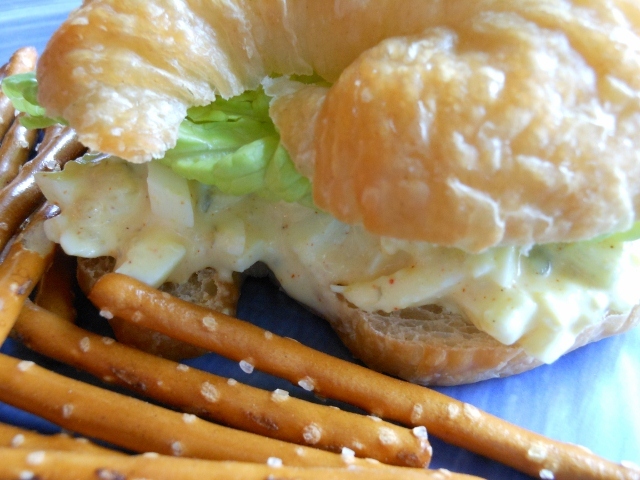 There are so many ways to dress this up but this simple version is tasty too. 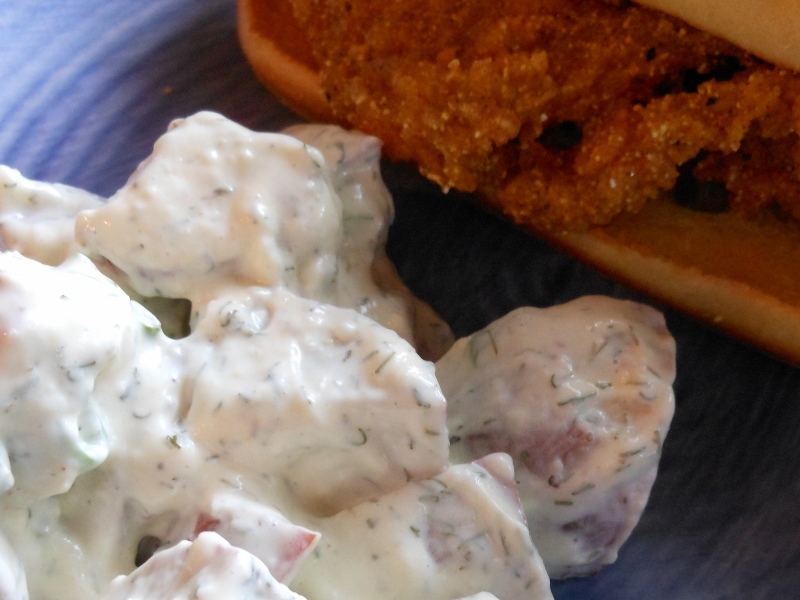 Aunt Donna’s Red Potato Salad with Dill ~ and a twist! 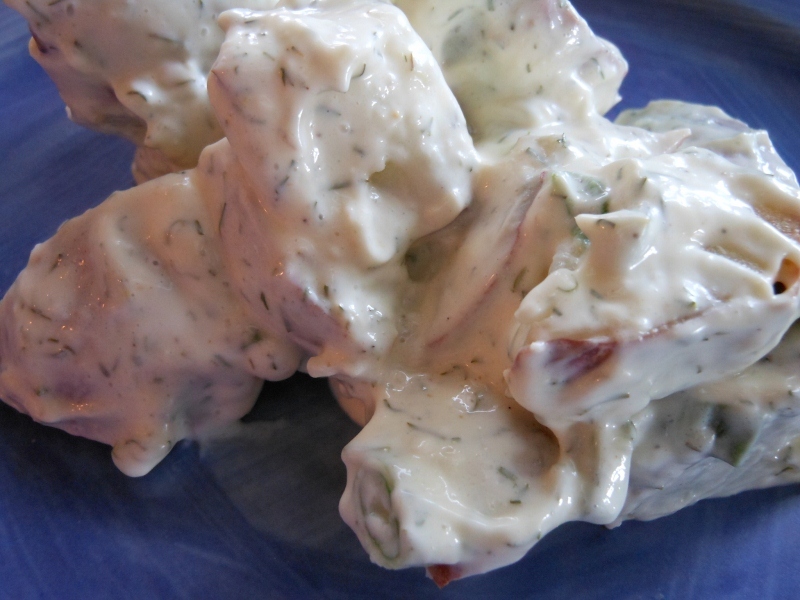 Red potato salad with dill is one of my favorites. I think my mother-in-law made it the first time I had it. She gave us a church cookbook a few years ago and apparently it’s Aunt Donna’s recipe. Anyway I decide to experiment a bit with it as I was in a roasting mood the other day while my oven was hot. I roasted the potatoes instead of boiling the spuds and added some horseradish for a kick. Here’s my updated version ~ I still like the original too, but this was quite delicious. Wash and pierce potatoes a couple of times. Spread on baking sheet and roast at 375 degrees for about 50 minutes. Cool potatoes in refrigerator until thoroughly cooled; I chilled mine overnight. 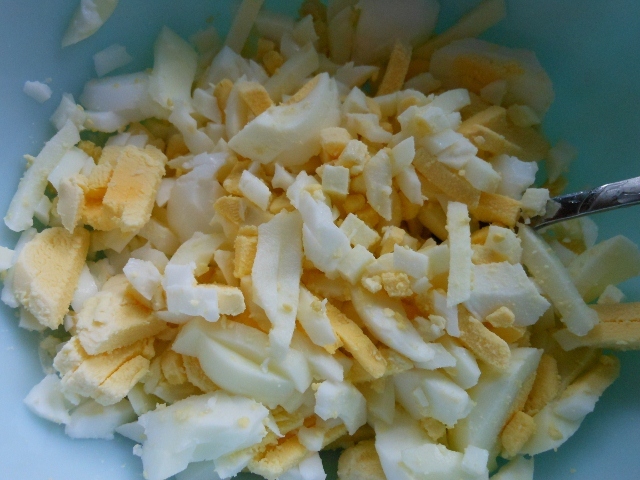 In small bowl mix together rest of ingredients. Dice cooled potatoes and mix with dressing. Refrigerate until ready to serve. Check for seasoning adjust as needed. This mayo was great on our steak sandwiches; in fact I think I will try it on my next fried fish sandwich too! It was a simple concoction and added a nice bit of flavor. Simply mix everything together and chill before serving. 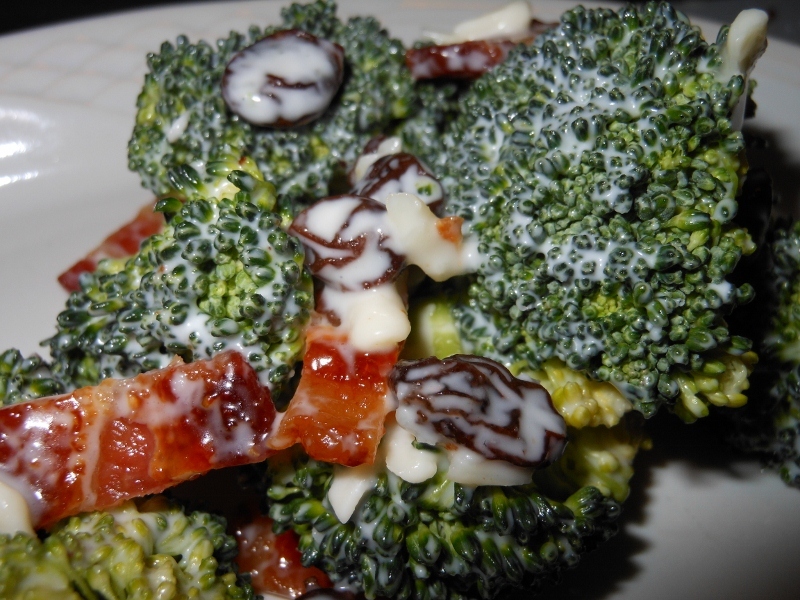 Broccoli Salad ~ broccoli, raisins, bacon and cheese! This broccoli salad is one of my favorite salads. I vary the dressing depending on my mood but it always has mayo, vinegar, and sugar to start. This trio is perfect for salads, dressings, and dips ~ in fact it is the key to our slaw dressing. 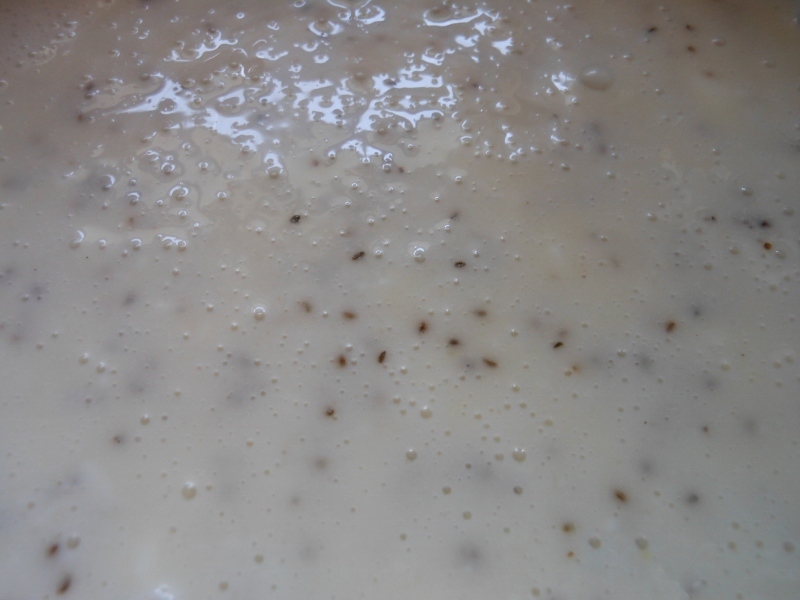 In small bowl combine mayo, vinegar, and sugar ~ you can vary the vinegar to your taste; rice wine is very mild (keep in mind a red or dark vinegar will discolor your salad ~ cider vinegar is a nice choice too). 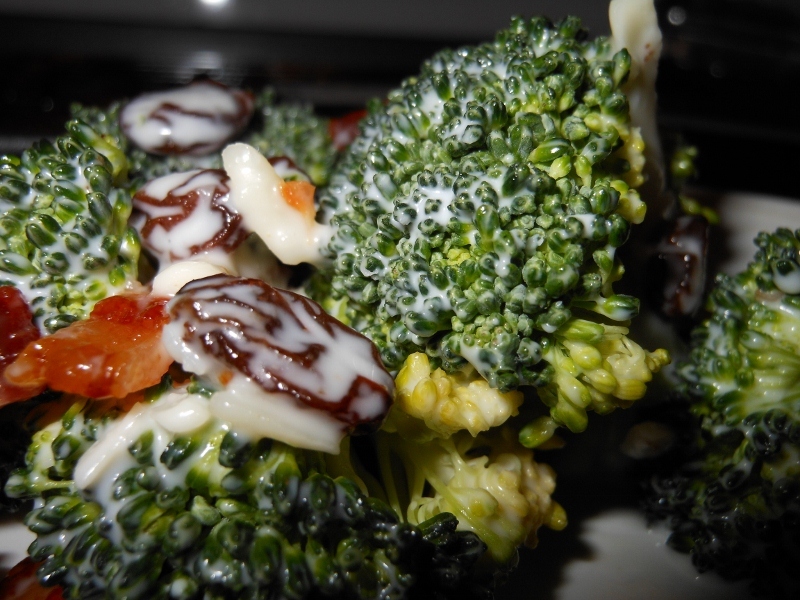 Trim broccoli to bite size pieces add cheddar and raisins. 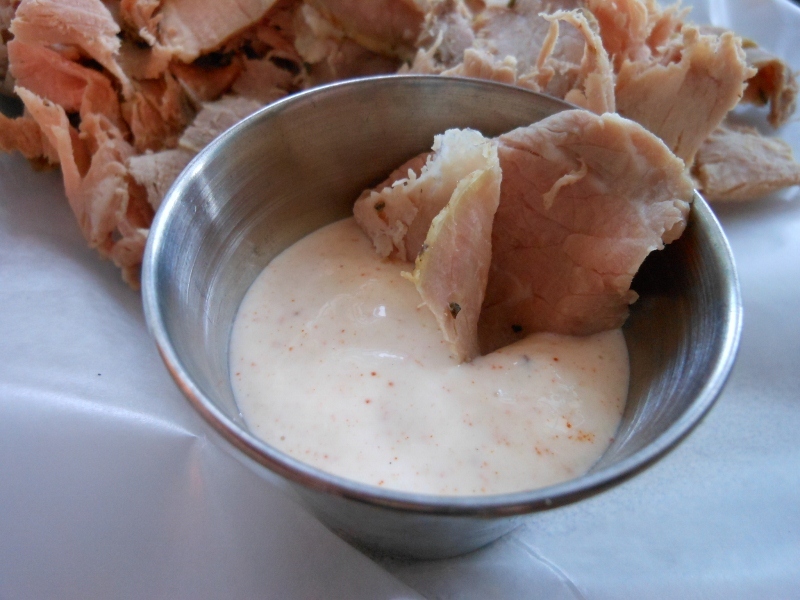 Pour dressings over top and stir in bacon; refrigerate for at least an hour before serving.